Tommy Chong portrays Cloris Leachman's love interest in this Friday's episode of Fox-TV's Raising Hope. In the episode, Virginia (Martha Plimpton) disapproves of Maw Maw’s new boyfriend (Chong) and his affinity for the recreational drug. The show has been moved to Fridays because of falling viewership. On Saturday, April 5th, the Cheech and Chong Up in Smoke tour featuring WAR is coming to American Bank Center Arena in Corpus Christi, Texas. Tickets go on sale this Saturday at 10AM local time via the ticket links above. Tommy Chong was on Doug Benson's (one of the funniest guys on the planet) show. It was a live show the other night. Doug Benson is back with another episode of Getting Doug with High with VERY special guests Tommy Chong and Kyle Kinane. They are live right now. On April 6th, the Cheech and Chong Up in Smoke Tour featuring WAR is coming to the Majestic Theatre in San Antonio, Texas. Tickets go on sale Tuesday, February 11th (tomorrow) 10am local time via the ticket link above. 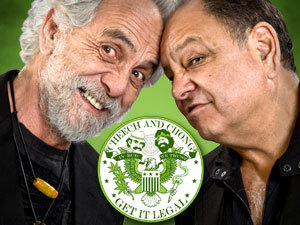 On March 22nd, the Cheech and Chong with WAR Up in Smoke tour is coming to the 1st Bank Center in Bloomfield, Colorado. They're cashing in on the whole legal marijuana thing so expect them to be in Colorado often. Cheech was interviewed in a gifting lounge for the 2014 56th Annual Grammy Awards. During the interview, he says that Cheech and Chong have been nominated for a Grammy for every album they've made and he reminded the interviewer that they won a Grammy for Los Cochinos. Cheech says they should be in the Rock and Roll Hall of Fame. He says their influence can be seen in bands like Korn and Soundgarden who cover their songs. Their producer, Lou Adler, was inducted last year.